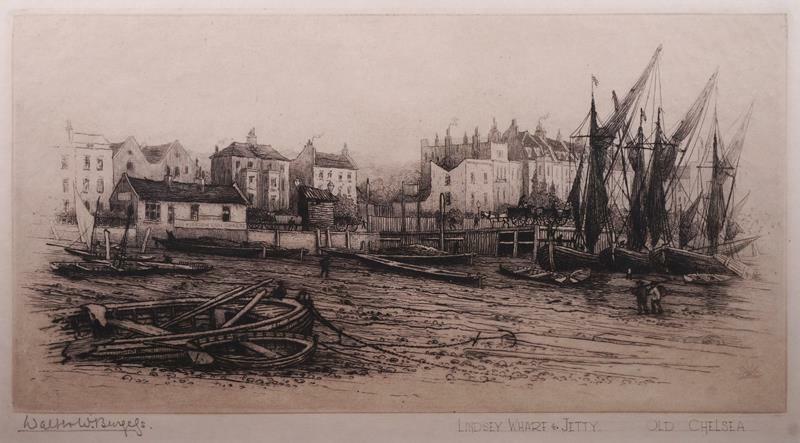 "Lindsey Wharf and Jetty, Old Chelsea". Signed and titled in the margin in pencil. Signed with symbol of the sun in the plate. From the series "Bits of Old Chelsea", a collection of forty-one etchings printed for the artist by Frederick Goulding and published in 1894 in an edition of 100. Kegan Paul & Co., London, 1894. Elected a member of the Royal Society of Etchers in 1883, Walter William Burgess was one of the finest British etchers of the late nineteenth century. He was a traditional artist of the old school and produced landscape and architectural views that can be compared with that of Samuel Palmer and Benjamin Robert Haden. During the early 1880's he contributed to arts periodicals such as The Etcher and in 1887 his set of Twelve English Cathedrals was published. He exhibited a large number of works at the Royal Society of Etchers and the Royal Academy between 1874-1903. Collections: British Museum and Victoria and Albert Museum.